If you haven’t been living under a rock, then you’re more than familiar with the current #NikeBoycott that Republicans have cooked up in response to a recent Nike ad. Earlier this month, Colin Kaepernick was announced as the newest face of Nike’s “Just Do It” campaign alongside a number of other well-known athletes. The ad is a black and white close up of Kaepernick’s face with these words written across it: “Believe in something. 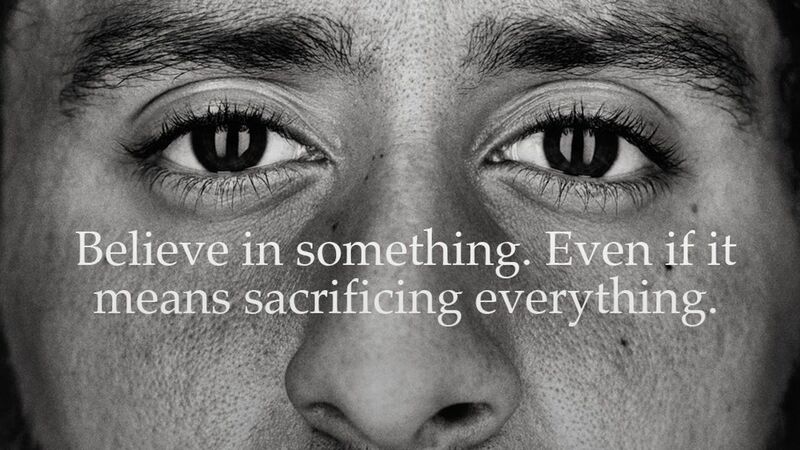 Even if it means sacrificing everything.” It’s supposed to be a reference to the former quarterback’s lawsuit against the NFL for pushing him out of the league because of his police brutality protests. The ad pissed off enough of Trump’s possie that they morons started destroying their Nike gear in response. Apparently, in their minds, it’s completely unacceptable to kneel in protest of inequality and racism, but it’s perfectly logical to burn your old clothes because a brand chose someone you don’t like for one of their ads. Here are some of the most ridiculous #NikeBoycott bonfires caught on camera. Fratboy Finkelstein over here recorded himself tossing a bunch of Nike sneakers into a firepit, one that he claims to have just bought a few days earlier. Why not return them then? Burning some old shoes isn’t going to hurt Nike’s brand. The kid doesn’t even know why he’s doing it and stammers with a pathetic explanation. Mommy and Daddy are going to have to buy him all new shoes because Kaepernick “… doesn’t share the same opinions of the people.” This kid clearly needs to revisit a dictionary, specifically the page with the word OPINION written on it. I’m not sure how I feel about this particular video. On one hand, this guy was logical enough to keep his shoes intact and not start a fire just because the internet told him to. On the other hand, he seemed to spend an exuberant amount of time and effort on these graphics. Hopefully, he was able to get this done during some downtime at his dull office job rather than actually using up any of his own free time. Mr. Mumbles here actually thinks he’s hurting Nike’s brand by burning his favorite pair of sneakers. News flash guys, you’re not Nike’s biggest buyer! Nike definitely chose Kaepernick to be the face of their brand BECAUSE of his public stance on the Black Lives Matter movement. This makes their ads more appealing to people of color because let’s face it, that’s where Nike gets most of their money from. Black men have more Nike shoes in their closets than most stores have in inventory. For some reason, this guy decided to burn his Nike sneakers in protest of the company while he was still wearing them. Talk about a #NikeBoycott gone terribly wrong. He even posted an update at the hospital later that day, turning him into an overnight internet sensation. 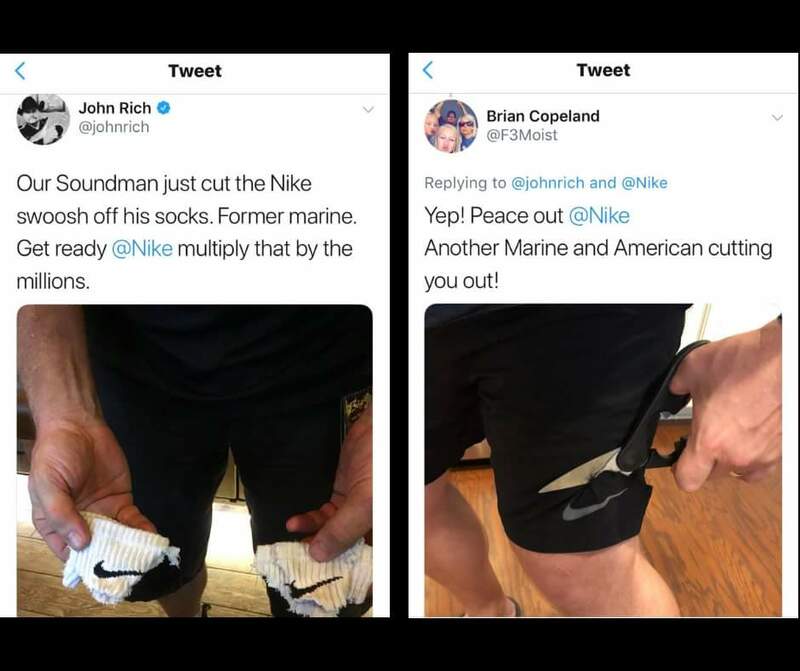 What the Marines have to do with Nike’s ad is beyond me, but this guy really shouldn’t be allowed anywhere near a pair of scissors. A true veteran would have donated his clothes to vets in need instead of destroying them. Why can’t the #NikeBoycott be something normal, like not buying Nike gear anymore? Such theatrics over a simple advertisement!